Black Friday? I don’t think it’s that dark. Yesterday we had a fabulous day! Our plans to go and visit my brother and family in Arizona fell through, and I’m actually relieved. That means we can kick back and relax this weekend. On Thanksgiving, we had a large Coleman family gathering at my aunt’s church. It was complete with basketball playing in the gym, driving some remote control cars around, wonderful food and sweet potatoes with the marshmallows. The turkey was wonderful and plentiful, and it was so much fun to chat with my cousins, who I don’t see nearly often enough. I made the maple pumpkin cheesecake, a pecan pie, an apple pie and a pumpkin pie. We have lots of pie leftovers in the fridge right now. I also made the green bean dish that I had thought I was going to make, and it was FANTASTIC. Really. And I never would have thought I would say that about green beans, but they really were a hit. My husband even said they were the best thing on the buffet, which I have to heartily disagree with, but I think I’ll for sure make these again, even when it’s not Thanksgiving. Want the recipe? Of course you do. Here you go. 1. In a large skillet, cook bacon and onion over medium heat until bacon is crisp. Stir in the remaining ingredients. Reduce heat; cover and simmer until the apple and beans are tender. I left out the apple cider vinegar, and I think they were great without it. I also sprinkled pecans on the top. It really was yummy. Oh, and I used canned instead of frozen beans. And No, I can’t follow a recipe as written. After dinner, there was some drama over a lost coat, but it was found, and my sister lost her daughter for a while, but found her in the nursery room, so all is well. The kids also put together a little play on the stage, which was very cute. Since we had eaten early, we decided to drop in on Ryan’s family and visit with them, too. They had already eaten and were in the act of Pythoning. (to python (verb)–to lay around and digest after having eaten a large meal, much like a python would lay there after eating a pig. I learned this word from my South African roommate way back when at BYU, and if anyone would know about pythons, I guess it would be her.) So we joined them for some fun, some pie, and even some fruitcake. What? Fruit cake on Thanksgiving? Whatever. I told Ryan to be sure and get some of his mom’s dressing, because he likes hers better, and maybe get some leftover sweet potatoes, because he likes them without the marshmallows. But we didn’t take any leftovers home. Can you believe it? No leftovers–well, except the large amounts of pie we have in the fridge. Maybe I should trade with my neighbors for some turkey and mashed potatoes. I mean, I’ve got a turkey in the freezer, and I can cook up some potatoes, but it’s not the same. After looking over the ads, I was thinking that I really did want to go out on the craziest shopping day of all crazy shopping days. There were some things at Walmart that were screaming deals, and I decided I wanted to at least try. I’ve never gone to a store at 5 in the morning before, and for some silly reason, I decided I was up to the challenge. I set my alarm, but I did it wrong (why does that always happen?) so I didn’t wake up at 4:25 like I planned. I woke up just a few minutes before 5, and thought, “Oh, I’m too late.” And tried to roll over and go back to sleep. But I was awake already and decided I might as well get up. In the cart there was a little map of all the black Friday items and where they were located in the store. I was after a certain item for one of my children. Let’s just call it a “glipslem”, in case my kids (or my kids’ friends) happen to read this entry. I saw that the glipslem was over in the pet isle. But there were all these people in my way. How was I even going to get over there by the pet isle? I cut back to the front of the store, went in front of all the registers to the side, and then did some fancy footwork to make my way to the pet isle. Oh, look! Cars! Put one in the cart. When I got to the general area, I asked a nice Walmart employee, “Do you know if there are any more glibslems?” Please, don’t be out. Please don’t be out. At this point, I really don’t have much of a choice, so what does it matter? “That’s great!” I said, and stuck it in the cart! Feeling charged by my victory, I went off to see if I could find some of the other great steals. After being stalled by traffic jam after traffic jam, I eventually found my way to the coats and sweatshirt display, and grabbed up a bunch of items for my family. And then I got in line. It was about 5:45 am. Wow. While waiting in line, I ended up leaving for a minute to grab a few more bargains that were right there, but mostly just stayed in line. I must apologize to the people around me. They probably thought I was a crazy stalker when I said, “I can tell the ages of your kids by looking at your cart.” I mean, it was totally obvious that they had a 4-5 year old boy who was obsessed with Cars merchandise, and a young girl who was getting that dolly, and an older kid (maybe 8-10) because there was the game “Operation” on the bottom. I really wasn’t meaning to invade your privacy, and I promise I won’t follow you home. I just can’t stand that long wait in line without at least talking to someone. If my husband had been awake, I might have thought about calling him to tell him about my big score, but A-he was NOT awake, and B-he doesn’t care. So, I ended up talking to the people in line. The guy behind me was here visiting his parents from California, and on a whim decided to do some early morning shopping. The lady next to me had been there since 2:00 am, in order to score her $88 powerwheels vehicle. Wow! That’s dedication. Finally, it was my turn at the register. It was self check, but there was a guy there to do all the scanning for me, so it wasn’t really self check anymore. But it was almost as bad as self check. I don’t know if it was his first day, but he definitely wasn’t a seasoned employee. When my glipslem (remember? we’re using a code word?) rang up at $78 something instead of the advertised $45, I was all over it. I showed him the ad, and asked if that wasn’t the right item, and shouldn’t it be $45? Poor Mr. Newguy asked some other guy, “Hey, can we price adjust this for her?” And they guy said that yes, he could. Only Mr. Newguy didn’t know how to do a price adjust, so he had to wait for a manager to help him do that. That’s ok, I’ve got all the time in the world to wait for you, as long as you don’t make me pay full price. He did get it worked out, but there were a couple other items that didn’t ring up as they should have. The worst was a men’s jacket, that I clearly took from the sale area, and it really should have rung up at $8, not $15. But I’m not going to dicker over that amount. If you can’t adjust the price to be $8, then just take the jacket off and I won’t get that. I don’t want it enough to pay $15. It’s black Friday for heaven’s sake. We don’t pay full price on black Friday! When Mr. Newguy tried to delete the item, it kept saying something like “item was not purchased” and it wouldn’t let him change the price OR delete the item. He ended up calling his friend over again, and she tried it, but it was giving her the same problem. She ended up deleting a young men’s jacket that was also $8, and then kept the $15 jacket ON the transaction, so I ended up paying $15 for two jackets instead of $8 each. Hey, that saved me another dollar–Great. And if I decided to return the $15 jacket, that would be an even greater deal. No, I’m kidding. That would be dishonest, wouldn’t it? But the thought did cross my mind. Anyway, I finally got all my items scanned and paid for, and made my way out through the vast expanse of parking lot to the car. I looked at my watch and it was 6:30. Hmmm. Is it too late to hit any other black Friday sales? Probably. But I wanted to check at Walgreens, because they had some “Schlebfins” on sale–buy one get one free. And you can never have too many “schlebfins”, can you? (Code again, remember?) There were only a few cars in the Walgreens parking lot, and –What?– there were people sitting in the cars. What the heck? I got out the ad, and Walgreens sale doesn’t start until 7 am. Wow! I’m EARLY. So, I waited in my car for another 5 minutes, and then decided that it wasn’t that cold. There were only two people standing in front of the door (well, one guy was sitting on a chair that he brought), and I went to join them. “What are you here for?” asked the nice lady in front of me. “I’m here for the schlebfins,” I said. “Oh! Me, too!” she said. She said she hadn’t even heard of schlebfins until a few weeks ago, when her daughter got one for a birthday present. The guy sitting down joined in about then, “I’m here for the tv.” I checked the ad. Wow, a 10 inch flat screen tv for $99 wasn’t too bad, either. The rest of the people were out of their cars by now, and we ended up chatting with Miss Smoker and her friend, who said, “What’s a schlebfin?” We told her what they are and that they are a fun gift for small people, and she decided she wanted one, too. Great. More competition. But I needn’t have worried. When the guy let us in a few minutes before 7, I went to the schlebfins and got my limit of 8, and then after I had bought those and taken them out to the car, I went back in and got 6 more. What? They make great presents!? And they were 1/2 off! By then, it was nearly 7:30, and I was done with my shopping. I took a trip through the Sonic drive through for a breakfast sandwich and then was on my way home triumphant. When I got home, the kids were up and wanting breakfast, and Ryan was still asleep. Nobody even missed me! I took off my jeans, put my pajama pants back on, and climbed back into bed for a little nap! Later, we dragged up a bunch of Christmas decorations, went to an indoor soccer game, picked up a friend for Cole who’s going to stay for a little while, and Ryan went to go help a friend with thier wiring and electronic gadgets. After dinner we put up and decorated the tree. And listened to Christmas music. The perfect after Thanksgiving day. I am so thankful for my many many blessings. I would be remiss if I didn’t list some of them here. ~I’m thankful for my husband. Ryan is in many ways a better person than I am, and he’s a great husband and wonderful father. He’s handy, he’s smart, and he’s funny. He supports me, he encourages me, and he is my partner in all things. And I love him. ~Cole, who is our lawnmower in the summer, our babysitter when we go out, and our resident “know-it-all” teenager. He tries hard to be a good person, and he thinks about things a lot. He’s also a lot of fun. ~Megan, who is either spunky and full of energy and helps out around the house, or the worst grump you’ve ever encountered. We never know which one it’s going to be. But she’s growing up and entering that “fun” teenage time, and becoming more responsible. She’s making my practice my patience. ~Natalie, who even when she was little was always singing or talking. She’s fun to be around, unless she’s forced to clean her room. Then it’s best to just close the door. She likes to bake and wants to help me with our pies for Thanksgiving dinner. ~Jenna, who likes to be helpful, and likes to be nice. She leaves little notes and pictures for all of us around the house to cheer us up. She takes gifts to her teachers just because. ~John, who at 5 is finally a “big boy” and we are proud of him. He is an easy going child who loves to play pretend by himself. I lay on the couch watching him the other day and asked if I could play with him, but he said No, that it was only a game for boys and cars, and not for moms. Ok. I’m ok with that. ~My wonderful group of friends. I really have been blessed with the best friends in the world. I have this group of friends that I’ve known since my early years. We’ve been together to support and help each other for more than 30 years. We’ve celebrated together, we’ve laughed together, gossiped together, and we’ve mourned together. I don’t know why I’ve been so lucky to have them as friends, and why they have loved and stuck with me for all these years, but they have, and I’m so blessed. ~In addition to these long time friends, I have met and grown to love new friends through the years. I am so thankful to live in the neighborhood where I do. I have wonderful friends who are here for me, and help out. I made a comment to one of my friends (as we were arranging carpools and picking up each other’s kids from piano) that together, we make a great mom. I know I can call them in a pinch to help me out, to pick up a child, or loan me an egg or an onion. And they are so much fun! I really do love to hang out with them. It really does take a village to raise children, or at least a neighborhood. ~And my bell choir friends, I can’t forget them. Who would have thought four years ago that I would have a new group of people that I would grow to love so much. During the slow times, we meet once a week, and even though we are rehearsing, and sometimes it is hot and exhausting and frustrating, we love it. It’s so wonderful to get together with people you love, and learn and play beautiful music. We have been set apart as musical missionaries, and that really is our goal–to share the gospel and our love for our Savior through our music. So, even though we are having so much fun, we really try when we perform to “show our testimonies on our faces” and share our love with the people who attend. During the busy times, we are often together every night of the week, and I see these people more than I do my own family. And I love them. And I am so thankful for this calling that is such a blessing in my life. ~I’m thankful for Ryan’s job. He’s been the provider and protector of our family, and allowed me to stay home and raise the children. My job is to save money where I can, and to provide the most comfortable home for the family. I get to be the decorator, the homework monitor, the cook, the cleaning lady, and the mommy. I get to go on field trips and drive carpools. And even though I get tired of those things, I’m so glad I don’t have the added stress of having to “bring home the bacon” AND fry it up in the pan. I’m also the “entertainment budget”. I often drag my family to fun and interesting things because I won passes, and while it’s always unexpected, it is usually fun. I’m so thankful that we’re able to afford our house, take care of our bills and obligations, and that we have enough left over that we can give to others. I could go on and on here, counting my blessings, but then I wouldn’t get anything done today. And I have a maple pecan pumpkin cheesecake to make, and have to decide on some kind of green bean dish. Maybe this one. I hope you have a wonderful holiday, and that you don’t forget to take the time to count your blessings, too. I didn’t even know that was an option. When I look outside I can see the beautiful trees and grass and see the lovely sunsets in the evening. Iâ€™m thankful for all the animals that live in the world, but Iâ€™m especially thankful for my pets. Iâ€™m thankful that we have a home to live in, and we have enough food and water to keep us healthy. Iâ€™m thankful that we have fun things to do, like paint pictures, color, do crafts, and that I have friends to play with. Iâ€™m thankful for my primary teachers, and for the songs we learn in primary that remind me of Jesus. Iâ€™m thankful for my family. They are always there to help me, and they love me. We have fun together. Iâ€™m thankful that Heavenly Father and Jesus love me enough to bless me with all of these things. I know that I am a child of God, and that I have a Father in Heaven who loves me. I know that Jesus Christ is our older brother and our Savior, and that he loves us, too. This is Jenna’s talk for Primary today. She helped me write it, and I think we did a darn good job. These are things I’m thankful for, too. Where do I even start? There’s been so much going on this week that I haven’t had any time to blog, or even compose a well thought out sentence. But I’ll try. For you, the faithful reader. REFLECTIONS–With 140 entries, and having done the PTA reflections contest 5 times before, you would think I would have been more organized and paced myself. Not so. I ended up with hours and hours or work to do, in this, the last week. Ugh. I called upon my neighbors and friends to help, and they did. I called my friend on Thursday and said I was having a breakdown and needed some help, and she willingly stepped up and called the parents of the winners so I wouldn’t have to to do it. My family spent Monday night helping Mom with reflections. We had a movie night and watched all the film and video entries, then stuffed 100 prize bags with Nerds, del taco coupons, Wendy’s coupons, Boondocks coupons, etc. until we ran out of bags. I called another friend and asked if she had more cello bags, and lo and behold she did, so I didn’t have to make a run to the craft store. Later we stuffed 45 more with other coupons and prizes. But Friday morning, with the help of Ryan, the PTA president and two of my best friends, we got the assembly set up, and made it through. There were some glitches, like I had the wrong age group on a child’s certificate, therefore it was on the wrong table. Some kids were confused that they were winners, but they weren’t moving on to the council level. Why? Well, because I like to give out as many medals as I can afford, even though not ALL of them are moving on. I should have been more clear on that fact. But all in all, I’m glad it’s over (well, it’s not OVER until I get all my paperwork done, get entry forms signed on the few that don’t have it done already, and deliver all the winning entries to the council person, but it’s Mostly over). BELL CONCERT–We rehearsed on Tuesday, had a dress rehearsal with an audience on Wed, and then had a concert last night. We have another one tonight, too. But last night’s concerts was FANTASTIC!! The tabernacle was completely full! We had packed the house. We felt like rock stars! It was amazing. No, we weren’t perfect and still made mistakes, but we did very well. We hope as we play that we convey not just our love for the music, but also our testimonies of the Gospel and our love for our Savior Jesus Christ. We were set apart as musical missionaries, and our hope is that we can share the Gospel through our music. Our director always tells us to wear our testimonies on our faces, and that is what we strive to do. I can only hope that tonight’s concert goes as well. WEIRD SYMPTOMS–Thursday at around 4:30, I began to feel like I had a canker on my tongue. Dang! I thought. I don’t have time for a canker. Within a half an hour, my tongue was covered with red bumps, and so was the inside of my bottom lip. What the heck? Thinking I may be having an allergic reaction to something ~but what, I don’t know~, I looked for a benadryl or antihistamine. In my whole box of medicines I could not find any benadryl or even generic for benadryl. I found a “Dayhist”, which is like “Tavist”, and I took that. Non-drowsy? I don’t think so. By then it was time for me to go to my Book Club dinner, and even though I was worried about my progressively swelling mouth, I went. My mouth felt like it was on fire. Or like I had taken a chili pepper and smeared it all over my tongue and inside of my cheeks. I told my friend in the car about my troubles, and warned her that if I stopped breathing, to take me straight to the hospital for a dose of epi. “What have you eaten?” she asked me. I was a little disappointed that no one at my book club had any knowledge of strange mouth rash. Usually when we get this group together, someone has had or knows someone who’s had experience with whatever it is we’re discussing. This time, they just looked at me and said, “That’s weird.” Thanks, gals. I enjoyed the dinner as much as I could with hardly any working taste buds, but I was quite dozy, so I didn’t enjoy it as much as I would normally have. When I got home, I called our local doctor (neighbor), but he didn’t call me back. As I went to sleep, I told Ryan, “If you come up and I’m not breathing, take me to the hospital.” Always the comforting one, he said, “If I come up and you’re not breathing, it’s probably too late.” Thanks. After a night of thrashing about and having bad dreams, I awoke to a less swolen, less inflamed mouth. Now it feels like it does AFTER you’ve had cankers and it’s getting better, but it’s still raw. How weird is that? Of course if I look up “mouth rash reaction to flu shot?” I get all kinds of horror stories of people who’ve had TERRIBLE side effects from a flu shot, and I decide I’m not going to read any more. Maybe it was the flu shot, maybe it was stress, maybe it’s some new allergy I’m just developing. Who knows? AND TO TOP OFF THE WEEK– Last night I was just about to leave for my concert. I was dressed up with makeup and hair done, and as I came downstairs I could smell an awful smell. What is that smell? I said aloud. Then I saw it. Someone had tracked in dog poop on their shoe, and had walked from the back door to the bathroom, then through the kitchen. AAARRGGH! I enlisted Ryan, and he found the offending shoe (along with it’s unlucky owner) and put her to work cleaning it up. I gave her the mop with the disposable pads, as that’s the easiest and most sanitary way to clean up such a mess. But me? I was out the door. Have fun with that, folks! Thankfully, they DID take care of it, and there was no offensive oder in the kitchen when I came back home. THE BIG GAME Today the family is doing a bunch of clean up work, before the big game. We’ve got lawn to mow, Christmas lights to put up, and a garage to clean. The inside of the house is not much better, with disasters in almost every room of the house and a HUGE pile of laundry to tackle. So much for “resting up.” I’ve got my concert tonight, too. But the real event of the day is the BIG BYU vs. UTAH game. I’m sure that’s what most everyone I know will be watching this afternoon. But we’ve made it through most of the week, and although it’s been rough, we’ve survived. Let’s hope the Cougars can say the same! BYU!!! Go Cougars!!! Hey, why don’t you blog about that? 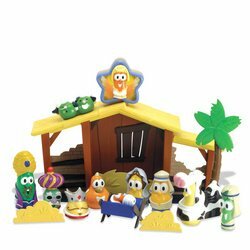 and the veggie tales set. Normally I would have said that it’s too early to get out the Nativity set. It’s the middle of November, for heaven’s sake! But Christmas seems to be starting early this year. Our neighbors have their yard and house COMPLETELY decked out and TURNED on, and they are not the only ones. This week is our bell choir Christmas concert. We’ve been practicing Christmas music since…well, since July, actually. So, if you want to get yourself into a Christmas mood, you’ve got three chances this week to attend this concert this week. I’ve also been buying Christmas presents here and there, so I’m thinking about gifts. On Saturday we gave our Christmas gift to my sister and her family. Yes, it’s a month early, but it’s always the right time for giving, isn’t it? We hope they can use their gift for a long long time. I’ve been listening to Christmas music for a while, but the kids for some reason think that we shouldn’t listen to Christmas music in the car. Whatever. I think they were just ticked off that we wouldn’t let them watch a movie on our short ride from Pleasant Grove. So, I say, bring on the Christmas cheer. I know we haven’t had Thanksgiving yet, and I’m not pulling out the tree and the decorations or anything, I’m just trying to prepare a little bit. I’m not trying to skip Thanksgiving, either. I LOVE Thanksgiving. We were going to go down to visit my brother in sunny Arizona for Thanksgiving, but that’s off now. So we’ll stay here and enjoy the time off from school and work. We’ll get together with extended family and have a wonderful day. And we’ll eat sweet potatos with marshmallows, thank you very much. And if you’ve noticed that the blogging has been sparse lately, you are correct. And I’m so sorry. I’m sorry if you’ve rushed over here daily to see what kind of shenanigans we’re up to and all you see is my four day old post about spilled milk. No, I didn’t go to SanDiego this weekend with my husband or my friends. And no, I’m not at all offended that two of my friends went to SanDiego this weekend and no one even invited me to go along. I did have a friend invite us out to party with them this weekend, and I, brilliant person that I am, went to the wrong place and then wondered where they were. Oh well, maybe we’ll meet up NEXT time. Well, I’ve been kind of swamped lately, and until I climb out of this mountain of work, I won’t be blogging much. We hosted a baby shower here on Saturday, and I was busy getting the house ready for that, (and speaking of babies, my sister had her baby on Friday–Congratulations, Chrissy!!) and I was trying to take advantage of the Oprah/Snapfish deal, and I spent hours downloading and then uploading pictures and arranging my book, only to have my kids close the window to play a game, then then arrange and arrange again and then them NOT credit me with the $29.99 for the book once I placed the order. I’m going to have to call them about that one). I’m just trying to tell you all that I’ve been busy. And I’m literally surrounded with piles of reflections entries in my office. A pile here, a box there, some prizes there, a box of medals there (medals that I ordered engraved, and when they came they were noticeably NOT engraved, so I’ve got to call about that one), a case of candy over there. I’ve got to get all reflections done by Thursday night, as our assembly is scheduled for this Friday. I’ve also got rehearsals or concerts or other obligations every night this week (except for tonight, and I think the theme of our FHE tonight will be…help Mom with reflections), so blogging is kind of low on my list. So– wish me luck, send good thoughts, send food, send money, send help. Whatever. We’ll get through this and then we’ll get to blog all about it. Note to self: Seven gallons of milk DO NOT fit on the top shelf of the fridge. Even if they are on sale for 99 cents a gallon as part of the Smith’s grand opening week sale. They just don’t fit. Note to Ryan: We probably need to move the fridge out from it’s cubbyhole tonight and clean underneath it. Unless we enjoy that rancid horrible curdled milk smell. What kind of a spelling word is that? cheerful; merry; gay; blithe; glad: a witty and jocund group. My fourth grader had to come up with a sentence for “Jocund”, and I didn’t even know what it meant. I had to look it up. Is that a word that’s in your vocabulary? Last week, as I walked out of the house and into the garage, I saw a tiny streak of black running through the garage. I dropped whatever I was holding (probably a bag of garbage) and jumped back into the house. No. No. Please don’t let that be what I think it was! No No NO! Because what I saw was either a mouse or a very large, very fast spider. I was hoping for the spider. I went back inside to the supposed safety of the house and informed my husband that I was pretty sure I had just seen a mouse, and we would either have to get a cat, clean out the garage, or move. You may think I’m overreacting on this little issue, but I’m not. Let me take you back a few years and fill you in on our history with the disgusting little creatures. About ten years ago, when we only had two little kids, we decided to up and move our little family to Illinois. Ryan had a consulting job with Illinois power, and we thought it would be an adventure to move to the midwest for a year or so while he did the job. Plus, there were some pretty nice financial compensations to entice us to move, so we decided to go. Since we weren’t planning on staying there for very long, we looked for a renter for our house. My cousin had just gotten married, and he and his wife decided to rent our house while we were gone. We gave them a good deal on the rent, and they didn’t mind that we left our stuff in the unfinished basement. It made the move a lot simpler to not have to worry about moving our food storage, unopened wedding gifts, boxes of book, holiday items and the like. We packed those things into the basement, and packed up the rest of the stuff and took it with us. In fact, we packed our CAR into the large truck, then they built a wall, and we packed the rest of the stuff in the second half, to tell you the truth. The job out there actually only lasted 7 or 8 months, and then it was time to move back again. I’m sure my cousin wasn’t too thrilled with moving out of the house, but they knew it was just a temporary thing, and they graciously moved out so that we could move back in. Once we got ourselves settled back in our own home, we realized we had some unwelcome visitors. It started with some suspicions whenever we’d go down to get something out of the storage area. There it was, the tell tale mouse poops on the shelf. Then we’d discover the entire box of granola bars–empty. Sugar and flour strewn across the shelf. Living in a dream world, we hoped that there had been mice, but they had all left. Ryan set some traps. When I saw one of the creatures run across the floor, I had a little caniption fit. More and more traps were set, until Ryan had trapped and killed at least a dozen mice in the basement. He also discovered their secret entry way into the house–the foundation zigged where the framing zagged, and there was an open overhang where the tiny troublesome creatures could easily gain access to the basement, and therefore the rest of the house. That corner was fixed, more traps were set, and eventually we felt like the house was livable once again. Back to the present–I am NOT going through that again. When I complained to my dear hubby, he informed me that HE was the one setting all the traps and disposing of the deceased critters, and I did none of the dirty work. But I had to LIVE in the house that was infested with rodents! With my little kids. I lived in fear that one of those disgusting things would bite us, or we would all catch the Hanta virus and die! And NO, I’m not overreacting. So, when I discovered that streak of fur, it was like reliving the nightmare. And in order to not let that happen again, I suggest we get a cat. Or borrow a cat. Or rent a cat. Something with a cat. Of course, that idea doesn’t go over real well with Ryan, who is allergic to cats, and he doesn’t believe that I could get an OUTSIDE cat and not let it come in the house. But I’ve talked to lots of people who say that cats CAN live outside, and they won’t die. Besides, if we don’t name it, we won’t get attached to it, and then if it decides to run away or dies, we won’t be all that sad, right? So there you have it. Clean the garage, set traps, get a cat, or we could just move. My daring husband set some traps in the garage on Saturday and caught ONE mouse that day. He assures me that it was just one, and the mouse problem is all over, and I don’t have to live in fear and not go in the garage anymore. But I don’t believe that it could only be one mouse, and I’m going to check into borrowing a cat while he’s at work. Cat play dates. Only we don’t have a cat for your cat to play with, only mice in the field. Or the garage. A piccolo? If that’s what it takes. I encouraged my kids to enter the contest for a new musical instrument from a local music store. I had to help some of them, but Cole did his own. I should get a new instrument because as a flautist I am never taken seriously. If I could get a piccolo, then my peers and my family would take me more seriously. If I got a piccolo then I would be able to further myself as a musician even more than I would have been able to with only my flute. If I had a piccolo, then I would be able to reach new heights in my musical career. Without a piccolo, I may have to live in a cardboard box. With a piccolo, I may get a music scholarship. Well, now. That’s a winning entry if I’ve ever seen one. Maybe. Cole is actually with the band on their tour right now. They got to march in the Main Street Parade at Disneyland, go to the beach, and attend workshops. Today they are recording in a sound studio at Disneyland. It sounds like fun. Although I’ve only heard from him once. On Wednesday night. I think he forgot about his instructions to “call me every day.” Hmmmm. Well, let’s hope he’s having fun.